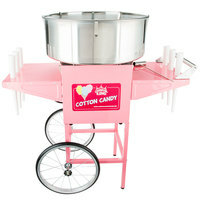 A commercial cotton candy machine is the perfect addition to any concession stand or snack shack located at a stadium, carnival, or fairground. By whipping up orders of this favorite sugary treat and setting them out for display, you’ll be sure to boost your business’s impulse sales and profits. 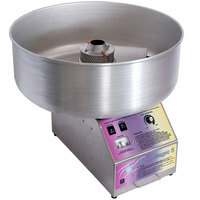 A commercial cotton candy maker is easy to use, too, and most models can spin up to 200 cones per hour, so you can keep lines of customers short! 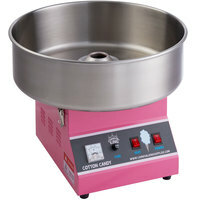 Each commercial cotton candy machine we offer comes with a high performance spinning head that won’t clog, making it a great alternative to units with traditional ribbon-style heating elements. You can also choose from machines made of various materials, depending on your needs. 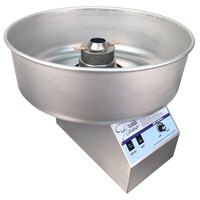 If you’re looking for a commercial cotton candy maker that provides maximum heat retention, browse our aluminum and stainless steel options. 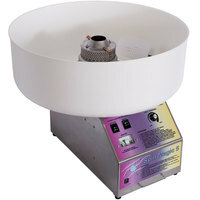 We also carry lighter weight machines with plastic bowls that are great for transporting. 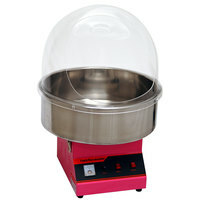 Perfect for carnivals, parties, food trucks, and other fun venues, this cotton candy machine produces 2 cones per 90 seconds for quick, sugary treats! 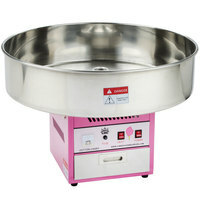 It comes with a 21" diameter stainless steel bowl and easy-to-use controls for intuitive operation. Plus, it includes a sugar scoop for pouring floss so you can get started spinning the sweet treats right away. 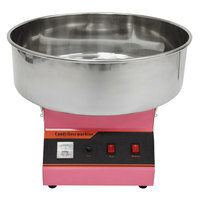 Offer a sweet, colorful treat with this cotton candy machine! 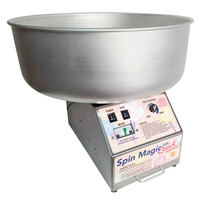 Featuring a large, 28" diameter stainless steel bowl, the machine accommodates up to 4 oz. of floss sugar in its spinner head and produces 2 cones per minute. Its fast operation ensures that customers don't have to wait long for their cotton candy, attracting hungry passer-bys in even the most dynamic, fast-paced environments, like carnivals and parties. The unit is easy operate, and a sugar scoop is included for your convenience.